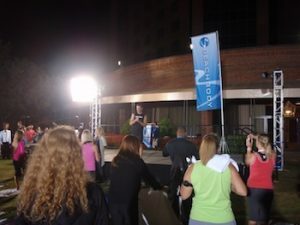 Two weekends ago Beachbody put on a conference in Dallas for about 300 people. Everybody there was a Beachbody Coach and has qualified one way or another in the Success Club competition. I had qualified to go to last years Game Plan Event in California and this was somewhat similar. What was cool to see was the amount of people had grown from 100 last year to over 300 year this. Just goes to show how much the business is taking off. I had qualified to go to the event and at first did not plan on going because my Alma Mater’s (Central Michigan University) Homecoming was on the same weekend. I had not missed a Homecoming since graduating in 2003. Its just so much fun and a time to see some of my old friends. But when I heard a week before the event that Tony Horton was going to be there leading a workout and they were going to be doing casting calls for the next P90X (P90X:MC2) and for a remake of Power 90 I knew I had to go. It would be awesome to be in one of those workouts let alone getting to haunt my friends and family in late night infomercials. With Beachbody paying for the hotel and most of the flight I knew I had to break tradition and go as it might be my one and only chance to be apart of something that is a major part of my life now. The meeting was taking place at the Hilton Anatole which must be the largest hotel I’ve ever been in. Took 3 minutes to walk from one tower to the other. After checking in I went down and hung out at the pool enjoying the 85 degree weather before getting ready for the dinner at night. 9 grams less sugar in the P90X Protein Bars – The old ones were good but these are even better. Had a chance to sample them. Dr. Bill Wheeler explained the benefits of the improvements to the nutrition products. He is Beachbody’s Chief Science Officer and knows what he’s talking about. Guy’s been employed by Olympic and professional teams along with working at the White House. He’s wicked smart. The next guy who went up on stage was Dr. Marcus Elliott from the P3 Training Facility. He was recently hired by Beachbody to help improve upon their products. While telling his story I thought it was interesting to hear that many of his clients are professional athletes and he trains them on how to get the most out of their bodies. His clients kept telling him that the best workout program they have ever done was P90X. Barry Zito defended P90X to the very end and said that the strength coaches who work for the San Francisco Giants did nothing close to what P90X did for him. It was that story which made Dr. Elliott inquire into Beachbody. This guy is also smart as hell. 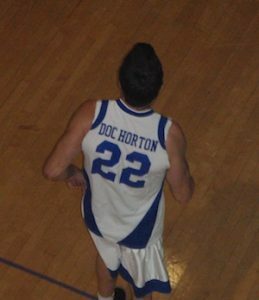 Went to Harvard and basically created his own medical field called Biomechanics. Dark and early the next morning (7 am) was the workout with Tony Horton. The sun had not even come up yet and we were about to do a sample of the P90X:MC2 workout which should be out next year some time. This was also going to be the casting call for everybody who was auditioning. Beachbody was looking for people who could keep up with Tony and I feel like I did well. A couple of the ab moves did get me but that’s to be expected. The hard is what makes P90X good. Its always that much more fun when working out with Tony. He seems to bring more effort out of a crowd of people when he’s standing up on stage. When the workout was over we were treated to a breakfast with some Shakeology. Meetings were scheduled for the rest of the day. Beachbody brings in speakers to all of their meetings to help us improve upon our business skills. The guest speaker for today was Terry Ward of the CommSkills Group. He had a lot of great things to say about how to present ideas to people. I learned that I say “um” and “you know” a bit to much and that I need to slow down when talking to people. The biggest news of the day came in the afternoon when Beachbody informed us that they were removing the one time $39 sign up fee to be a Beachbody Coach until Dec. 31st. This is big news for people who are already coaches or thinking about it. For many people, the 25% discount that Coaches get on the products is enough to join (its why I did at first) and with them removing it people can save even more. There is no reason to not sign up now. When the meetings were over Beachbody Corporate took on the Coaches in a basketball game. To make it a little more fun, Beachbody brought in a Harlem Globetrotter to do some coaching. He put on a dribbling exhibition which was cool. The “P90X Man” himself, Tony Horton played alongside CEO Carl Daikeler. Tony had a “Doc Horton” jersey which was fitting since that’s what Jim Rome calls him. The Coaches ended up winning and I think it would of been by a landslide if it was not for Loren from corporate who scored 70% of their points. I met him on the Top Coach Hawaii Trip and he must have the coolest job at Beachbody as he travels with the coaches and records what we do amongst other things. After the game we went to dinner with some of the other coaches. I had a chance to meet some new ones and hear their stories and meet up with ones I’ve met before. Sunday morning started off with a workout led by Donna Richardson Joyner of Body Gospel. The workout was much different than any Beachbody workout I’ve done before as it included a congo line. Her energy is amazing. She made me smile the entire time. Breakfast and Shakeology followed the workout. There was only a half a day of meetings and most of it included new promotions Beachbody was offering and a presentation from MJ Durkin. He’s a sales and Network Marketing guru. Most of the stuff he said I had heard before when I worked as a mortgage banker but its refreshing to hear some new ways to explain what you’re trying to talk about. Craig Holiday gave a brief presentation which was very informative. All in all I was glad that I decided to come (especially when I found out my Chippewas lost on the last play of the game). I still think its crazy how much my life has changed in the past 2 years since I became a Beachbody Coach. The products have changed my health and fitness and the business just follows. I was wearing my P90X hat on my flight from Detroit to Dallas and both flight attendants asked me about P90X because they knew somebody who was doing it. I gave them my business card and followed up with them when I got home. It seems that this is happening to a lot of other people by the looks of it. I really feel like this business is going to keep on doubling over the next couple of years especially knowing the new products they have in the works and that’s just awesome. Here are some pictures from the weekend. When do you think the quicker version of insanity will be available ? Do you mean the Insanity Asylum? Not sure exactly. I’ve heard Spring 2011. Yes, that is the one that is going to be an express type workout right? Ok. I did some research and I think I am talking about the Fast and Furious DVD. I already have insanity. How do I get that DVD? You can find it inside the Beachbody Store.